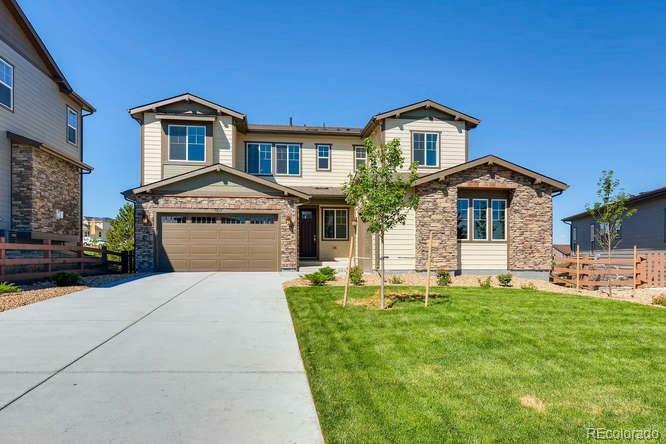 With 5 Bdrms, 4.5 baths, the Torrey Pine floorplan is sure to meet any need. Main Floor living offers Study, Great Rm with gas fireplace, Guest Suite, Open Kitchen with Island/Breakfast Bar, Double Ovens, W-I Pantry and Dining Area. Second Level is equally impressive with a loft and convenient laundry room. Master Suite has 2 W-I Closets, Linen Closet and beautiful 5 pc Master Bath. 2 Secondary bdrms share a Jack & Jill Bath, while the other Bdrm has a private full bath. Mud Room with closet & bench off 2 bay Garage. Additional 1 bay side load garage. Full Walk-Out Basement offers R-I plumbing and options to finish for addtl family room or bedrooms! Move in ready.